My kitten walked across my iPad screen while Alto's Adventure was paused. Now, there are no goals, no option to get back to the workshop, no option to change characters, and the music is different. I feel like I fell into the zen dream version of the game. What happened? How do I get back to smashing my goals? It sounds like you accidentally activated Zen Mode. The zen mode essentially takes the challenge out of the game; when you crash, you can simply pick up where you left off, and you can do new things like bounce off of rocks. To disable Zen Mode, pause the game and press the “home” icon. From the home menu, swipe from the left or right edge of the screen to toggle Zen Mode on or off. Not the answer you're looking for? Browse other questions tagged altos-adventure or ask your own question. How long does it take to proximity wingsuit fly for 100m? How do I view my completed goals? 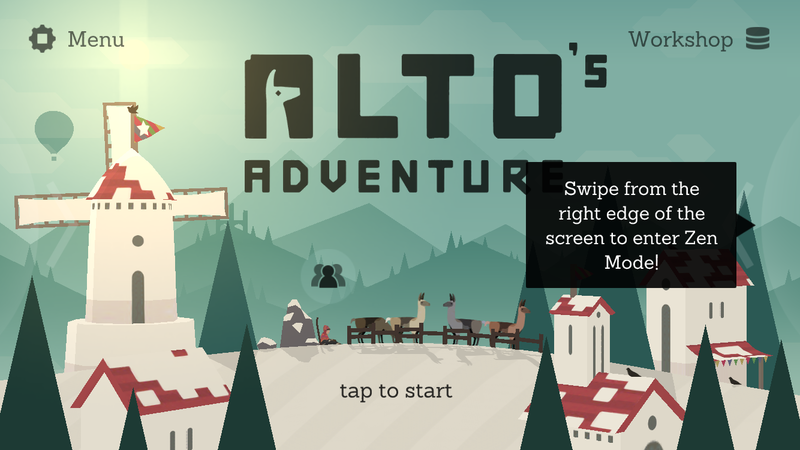 What is the max level in Alto’s Adventure? How long is a full day in Alto’s Adventure?